In a brand new piece focused on diverse cultures of San Diego, and funded by San Diego Foundation, Yale Strom has turned his attention to the music and history of our Somalian community. Creative Catalyst Grantee Yale Strom is most famous for his work with Klezmer and Roma music. An internationally acclaimed film director, composer, photographer, playwright, and musician, he has performed with his band Hot Pastrami in venues around the world. He is a pioneer ethnologist of 3 decades who originally focused on the Jewish and Roma communities in Central and Eastern Europe. After 75 research expeditions, Strom has become of the world’s leading scholar-ethnographer-artist of klezmer music, history and culture. In a brand new piece focused on diverse cultures of San Diego, and funded by San Diego Foundation, Strom has turned his attention to the music and history of our Somalian community. After conducting extensive research, he has composed a new classical piece exploring the authentic folk music of the Somalian community, Somalia Quartet. 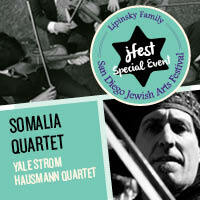 Somalia Quartet will be performed by the acclaimed Hausman Quartet. Hailed as “an accomplished young foursome with a luscious sound and an experimental bent”, the Hausmann Quartet has become known for its powerful, dynamic performances and commitment to community engagement. Now in its 11th season, the quartet has established itself an integral part of the cultural life of Southern California as faculty Artists-in-Residence at San Diego State University and Ensemble-in-Residence at Mainly Mozart. The Hausmann Quartet are violinists Isaac Allen and Bram Goldstein, violist Angela Choong and cellist Alex Greenbaum. The program will include the Hausmann quartet playing Bartok's Quartet No. 2 and Strom's Somalia Quartet inspired by folk themes, and then will be joined by Yale Strom for several Klezmer classics. The program will then conclude with the world premiere of Somalia Quartet. This performance will be FREE and open to the public. Follow the ticket link below for tickets. It will also feature complimentary Somalian food. 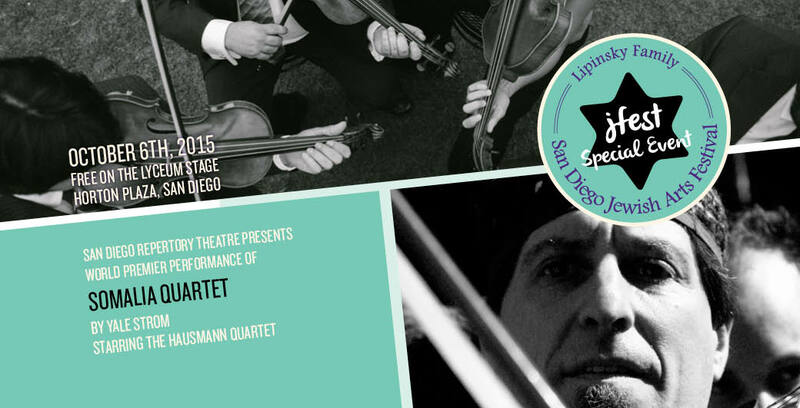 This performance is commissioned by the generosity of the Creative Catalyst fund of the San Diego Foundation. An award-winning musician, author, filmmaker and scholar, this maverick does so many things with such great skill and vision that he's in a league of his own.